Pseudobulbar affect (PBA) is a distressing neurologic condition that occurs secondary to brain injury or underlying neurologic disease affecting the brain. A recent study found that 9% of nursing home residents had symptoms suggestive of PBA and were receiving more psychiatric medications than those without symptoms.1 Improving the diagnosis of PBA may help optimize the management of this underrecognized and underdiagnosed condition and potentially reduce unnecessary medication burden. The physiological impairments underlying PBA are incompletely understood. In the normal state, the frontal and temporal cortex process internal and external stimuli and send signals to the brainstem, which controls the outward expression of emotion. Brainstem connectivity with the cortex helps coordinate the physical expression of emotion in the face and other parts of the body. PBA has been seen to occur when these signaling pathways are disrupted as a result of nervous system pathology,2,4 consequently leading to uncontrollable episodes of involuntary crying, laughing, or both. Episodes of involuntary emotional expression may occur several times per day and can last from seconds to minutes. It is estimated that more than 2 million Americans may suffer from PBA.6 A population-based registry study conducted in the outpatient setting of more than 5,000 adult patients with brain injury and certain neurologic conditions assessed the prevalence of PBA symptoms across different disease groups using the Center for Neurologic Study-Lability Scale (CNS-LS). The CNS-LS is a patient-reported, nondiagnostic screening instrument that measures frequency and severity of laughing and crying symptoms that may signal PBA.7 Results of this national study, known as PRISM (Pseudobulbar affect Registry Investigating Symptom Management), reported that 37% of enrolled patients had PBA symptoms (defined as a score ≥13 on the CNL-LS), including 52% of patients with TBI, 46% of patients with MS, 45% of patients with ALS, 38% of patients who had suffered a stroke, 29% of patients with AD, and 26% of patients with PD.8 Of those, approximately 6% to 16% had more frequent or severe PBA symptoms as defined by a CNS-LS score of ≥21. Neurologic conditions, particularly stroke, AD, and PD, are common in nursing home residents, but the prevalence of PBA symptoms in nursing home residents had never been formally measured until recently. 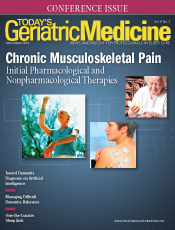 In collaboration with the Department of Public Health Services at the University of Chicago, an observational study was conducted to estimate the prevalence of PBA symptoms in a sample of US nursing home residents and evaluate the relationship between PBA symptoms and other clinical and behavioral correlates, including the use of psychopharmacologic medications. Avanir Pharmaceuticals sponsored the research. Results of the study, published in the International Journal of Geriatric Psychiatry in November 2015, found that more than one-half of the nursing home residents (412 or 51%) had a predisposing neurologic condition known to be associated with PBA (eg, PD, AD, stroke, TBI, MS, or ALS).1 Within this predisposed population, 72 residents had a CNS-LS score ≥13, suggesting the potential presence of PBA in these individuals. This finding translated to a potential prevalence of PBA of 17.5% in the predisposed population (those with neurologic disorders and without psychosis or disruptive behavior) and 9% among all nursing home residents. The study also found that residents with PBA symptoms were more likely to be using antipsychotics, as well as anxiolytics and antidepressants. Approximately twice as many residents with PBA symptoms were prescribed antipsychotic medications compared with those without PBA symptoms (25% vs 13.5%, p=0.02). Similar results were seen with anxiolytic medications, with 25% of residents with PBA symptoms receiving treatment compared with 14.1% of residents without PBA symptoms (p=0.02). Antidepressant use was common in both groups but the difference between those with and without PBA symptoms was not statistically significant (62.5% vs 53.2%, p=0.15). Identifying and managing PBA can be challenging for clinicians because it is underrecognized and the symptoms overlap with those of depression and other psychiatric disorders. Additionally, PBA may not be diagnosed as a distinct and treatable condition but attributed along with other symptoms to the neurologic disorder from which it arose. Possibly because of its overlap with comorbid psychiatric disorders and depression, antipsychotics, antidepressants, and anxiolytics are sometimes used to manage PBA symptoms. This occurs despite the lack of substantial clinical evidence supporting their use for this indication and the fact that an FDA-approved treatment for PBA is available. As the first study to investigate the prevalence of PBA symptoms in nursing home residents and evaluate real-world treatment patterns, the results suggest that off-label medications are potentially being used to treat PBA in nursing home residents. Many psychopharmacological medications can pose hazards to older adults, particularly those with dementia. Therefore, avoiding unnecessary medication use is recommended. This is particularly important in patients with PBA, where other treatment options are available. These findings underscore the importance of more accurate diagnosis of PBA. — Kevin Foley, MD, FACP, is the director of academic and clinical operations in geriatrics in the department of family medicine and an associate professor in the division of geriatric medicine at the College of Human Medicine at Michigan State University. He also serves as medical director of the Alzheimer's Disease and Memory Disorders Service in the neuroscience department at Mercy Health-Saint Mary's in Grand Rapids, Michigan. — Charles Yonan, PharmD, is senior director of global health economics and outcomes research in the department of medical affairs at Avanir Pharmaceuticals, Inc.
— Jani Bergan, MA, is a senior editorial specialist at W2O Group, a San Francisco communications company. 1. Foley K, Konetzka RT, Bunin A, Yonan C. Prevalence of pseudobulbar affect symptoms and clinical correlates in nursing home residents [published online November 2, 2015]. Int J Geriatr Psychiatry. doi: 10.1002/gps.4374. 2. Parvizi J, Coburn KL, Shillcutt SD, Coffey CE, Lauterbach EC, Mendez MF. Neuroanatomy of pathological laughing and crying: a report of the American Neuropsychiatric Association Committee on Research. J Neuropsychiatry Clin Neurosci. 2009;21(1):75-87. 3. Schiffer R, Pope LE. Review of pseudobulbar affect including a novel and potential therapy. J Neuropsychiatry Clin Neurosci. 2005;17(4):447-454. 4. Wortzel HS, Oster TJ, Anderson CA, Arciniegas DB. Pathological laughing and crying: epidemiology, pathophysiology and treatment. CNS Drugs. 2008;22(7):531-545. 5. Work SS, Colamonico JA, Bradley WG, Kaye RE. Pseudobulbar affect: an under-recognized and under-treated neurological disorder. Adv Ther. 2011;28(7):586-601. 6. Colamonico J, Formella A, Bradley W. Pseudobulbar affect: burden of illness in the USA. Adv Ther. 2012;29(9):775-798. 7. Moore SR, Gresham LS, Bromberg MB, Kasarkis EJ, Smith RA. A self report measure of affective lability. J Neurol Neurosurg Psychiatry. 1997;63(1):89-93. 8. Brooks BR, Crumpacker D, Fellus J, Kantor D, Kaye RE. PRISM: a novel research tool to assess the prevalence of pseudobulbar affect symptoms across neurological conditions. PLoS One. 2013;8(8):e72232.